Our lives now represent the one event every creature anticipates withheld breath, standing on tip-toe as it were the unveiling of the sons of God. Can you hear the drum roll? Every creature suffered abuse through Adam’s fall; they were discarded like a squeezed out orange. Creation did not volunteer to fall prey to the effect of the fall. Yet within this stark setting hope prevails. All creation knows the glorious liberty of the SONS of God sets the stage for their own release from decay. We sense the universal agony and pain recorded in history until this very moment. We ourselves feel the grief echo of their groaning within us while we are ready too EMBRACE the ORIGINAL BLUEPRINT also of our physical stature to the full consequence of SONSHIP. What we ALREADY NOW PARTICIPATE in as first fruits of the spirit will bloom into a full gathering of the harvest. For what we already experience of salvation confirms our hope and continues to fuel our expectation for what we still cannot see. In the final visible completeness of the harvest, hope has fulfilled its function. Through the cross we co-died and became co-heirs with Christ. This act brought mankind into sonship. Sonship! Do you get the ramifications? We have a new lease, Adam’s fall has been wiped clean. You hear stories of prisoners who have been behind bars for decades and have been released and still act like prisoners. 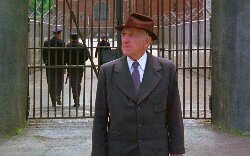 Jame Whitmore’s character in the Shawshank Redemption had been in prison since his late teens and was released an old man. He was free but he didn’t know how to cope with his freedom. He still acted like he was in chains asking permission to use the bathroom among others. He didn’t understand traffic or how to cross the street. He knew about street and cars. He had knowledge of what they were but it was merely cognition not understanding of the practical. We are like that, I’ve often used the terminology “we are sons and daughters of God” but I never walked in it or even remotely understood what it means. I am a joint heir with Christ! What he gets, I get. He has access to daddy, I have access to daddy. I’m a parent of four kids; Savannah, Shakanah, Benaiah, and Moriah in that order. I cannot honestly say I have a favorite. In fact I have told them when we are alone (one on one) that they (which ever one is with me) that they are my favorite. Each one can come and ask me a question at any time and I will see what can be done to answer there question or make a request possible. No good father/mother will give their child a spider if they ask for a _______________. I am God’s son his child. I am not a servant or a guest. I am his favorite. Jesus’s act of sacrifice on the cross redeemed our innocence, it brought us back to that pre-fall relationship that Adam and God had in Eden. Your original identity is that of a fully functional son/daughter of God! Grasp your original blueprint Dude! Give the word your undivided attention; do not underestimate yourself. Make the calculation. There can only be one conclusion: your authentic origin is mirrored in the word. You are God’s poem; let his voice make poetry of your life. I think this post is wonderfully inspirational. I will be giving it even more thought. Thanks for a terrific read! Peace be unto you! Dude! ….. you nailed it!!! For the first time “I” feel accepted and loved by my heavenly father. What i so easily accepted with great joy for everyone else, i can now accept for myself. Such an awakening of marvelous treasures and love!!! You need to prayerfully pray to the father about your platform because i see an anointing for all of gods prodigals and there are multitudes upon multitudes far outnumbering the imaginable. If you can serve up messages like this and crack my prodigal nutshell which no one has ever come close, then you can reach the multitudes and put satan out of business and bankrupt the kingdom of darkness!!! Thank you so much for your servants heart and diligence to the word of god!! Appreciate the kudos, im happy it spoke to you. I have no desire to build a platform, been there done that. That’s what put me into the desert to begin with. I suggest you keep getting into the word daily. I went and bought a copy of The Mirror Translation, its a translation of the Bible that is not completely finished but has been amazing. I use it more as a commentary than a Bible. Take Romans 5-8 and literally spend the next 4 weeks going through it. Take 1-2 verses at a time, read through them in multiple translations. Write down your initial thoughts, stop. Pray, ask God to reveal what he is saying, contemplate on the verses, re-read write down any thoughts you get. Journal it. My blog started as my journal. I am not worried about commercializing it. If people read it ….cool, if not….cool. Stay humble and go deep. I will take your advice, prayerfully study, go deep and be transformed. I hear you about platforms. They belong to god and he will reach whomever he desires if it be by blog or by federal express delivery. My reference to platform wasn’t for capitalization but for realization. Anointings are so fluent and easy for the anointed that we don’t realize they are in operation. My point is god has anointed you with prodigal messages that are yolk destroying, burden relieving, so keep doing what you are doing and leave the rest to god. If we don’t encourage each other in the gifts that god has placed on us then we end up in the desert experiences. If it weren’t for my dear friend crystal i would be a full bubble off standing here like a “deer in the headlights” kind of fright. Thanks to her giving me feed back on what god was doing in her life through anointings, well now I’m only half a bubble off minus the deer. Ya gotta love progress no matter how great or small. Please keep your messages coming. Even though i have had the biggest breakthrough ever to date, i still have many “oh my-lanta” moments. Thanks again for your encouragement and putting gods word and his love where the rubber meets the road!!! Point taken, I plan on keeping moving forward, don’t want to go back.